As I continue to stroll down memory lane of the Upfronts ’08, there’s no way I can talk about my week without talking about getting to see the cast of my favorite show, THE OFFICE. Yes, I was lucky enough to meet the cast last year, but it really doesn’t matter. I still get just as excited about seeing the collective group that make me laugh out loud every Thursday (ok and every Tuesday if we are talking TBS reruns). Just being near them I had this stupid smile on my face (as seen in the pictures below). Now the weird thing about the Upfronts is that the stars are just kind of hanging out. They’re walking around and talking with friends, and such was the case with the cast of THE OFFICE. The first cast member I spotted was Oscar Nunez, who was sitting on a bench chatting it up with Sendhil Ramamurthy (Mohinder from ‘Heroes’). That’s when the excitement kicked in. Dunder Mifflin was in the house. After seeing Oscar, it seemed everywhere I looked there was a DMer. First Mindy Kaling, then B.J. Novak. I spotted Phyllis Smith and Leslie David Baker and then the lovely Kate Flannery. Next thing you know they were all there getting settled on the big white couch. As the cast was one of the biggest draws at the event, there was a designated area where fans could take pictures. The line started 45 minutes before the cast even arrived. The cast members in attendance were: Ed Helms, Leslie David Baker, Phyllis Smith, Rainn Wilson, Paul Lieberstein, Craig Robinson, Jenna Fischer, Brian Baumgartner, Oscar Nunez, Kate Flannery, John Krasinski, Creed Bratton, Mindy Kaling and B.J. Novak. Steve Carell was there for the press line but he was busy rehearsing for SNL across the street. Oh and as much as I would like spinoff casting rumors, no Scott Adsit (Pete, 30 Rock) isn’t joining the cast…he just snuck in for this picture. So here are a few pictures that I snagged that night. It’s always so surreal to be able to talk to your favorite performers up close and personal. 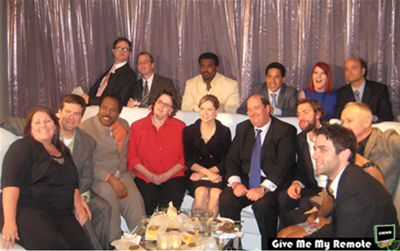 And although it’s been said by me and countless others, the cast of THE OFFICE are genuinely nice people. Based on the smiles and laughter, they truly enjoy each other’s company, and the couldn’t have been any nicer to any of the fans who waited around for their chanced to interact with the cast of their favorite show. My jealousy of you knows no bounds! These pictures are amazing. Thanks for sharing! OMG! JKras’ face is touching your face!! O.M.G! Did you hear how Angela is doing? The role of “Beardy at Corporate” will now be played by John Krasinski. Man, you are Lucky. Like, insanely lucky. Still hot, so it doesn’t really matter-at all. Kath, have I told you lately how completely jealous I am of you? 😉 Not only do you have an adorable photo with J.Kras, you also snagged a photo with my fave, Ed Helms and got to sit close to him in that group photo! Ha – really, though – great photos! Glad you got to see the cast again! So cool! I know they’re just people like everyone else, but it still has to be a rush to meet them.